December 7, 2018 by benign0 0 comments on "Only a Philippine court can decide whether or not Rappler CEO Maria Ressa is guilty of tax evasion"
The embattled CEO of Rappler continues her dramatics all the way to court to defend herself against tax evasion charges. 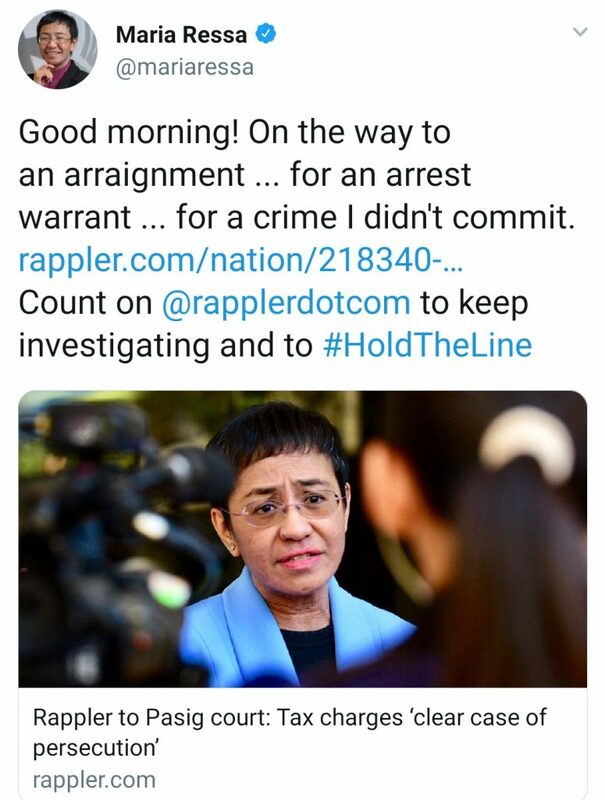 In a recent tweet, Maria Ressa insisted that these are charges for crimes she “didn’t commit”. But, really, Ressa’s innocence or guilt on the matter of her tax evasion charges is not for anyone to decide other than a Philippine court. Nonetheless, Yellowtards continue to emotionally-blackmail its peers in the industry, ABS-CBN News and GMA News Online to “speak out” on Maria Ressa’s “plight”. Thing is there really is nothing to say on the matter other than that alleged crooks should observe due process and respect the ruling of Philippine courts.